The solemnity of Mary, Mother of God, leads us into the New Year under the inspiration of a young woman whose decision to the puzzling news of the angel Gabriel (Lk 1.26-38) opened the way for the greatest mystery of creation and history: the incarnation of God in Jesus of Nazareth, the birth of God in the person of Jesus. Mary, through her free and total cooperation in the mystery of God’s plan of salvation (Lk 1.26ff), is the one on whom God let his face shine (Num 6.26). It is through Mary’s motherhood that God incarnated in Jesus Christ his eternal guarantee and the new covenant of salvation, atonement, and peace (shalom) to humanity. Against the background of references to peace, to divine blessing as invoked in the priestly prayer recorded in the first reading (Nu 6.22-27) Popes have set the annual Message for the World Day of Peace. The initiative of the World Day of Peace Message on the first day of the New Year was launched by Pope Paul VI in 1967. Since then the Popes have issued a message, addressed to Christians and people of good will, on subjects of vital concern for the furtherance of peace, justice and development for the family of peoples of our planet. These messages profile for us the unbreakable connection between faith in God and care for the quality of life for all people. These messages spell out for us the challenging and irreducible social and societal implications of Christianity. This year, 2018, Pope Francis dedicates the 51st World Day of Peace Message to Migrants and Refugees : women and men in search of peace. This subject evokes compassion on the part of many. Think for example of the massive support and contributions given by this diocese and by parish communities throughout Ireland to appeals from Trócaire and other such organisations. Think of the idealism and courage of many of our young people, and women and men not so young, who have gone from our communities to refugee camps to work and help refugees. Think of sailors, mariners from our own shores, who have volunteered to help on rescue boats in the Mediterranean – they have saved and rescued countless persons fleeing hunger, war, persecution, and the ecological and environmental devastation of climate change. Think too of the gathering and transport of goods, medicines, and vital supplies by organisations like St Vincent de Paul. So much good flows in our world to tackle and alleviate suffering and disaster. Yet so much remains to be done in order to address the sources and root causes of the now global refugee crisis. Tackling those root causes is clearly the domain of politicians, economists, educationalists and others. That work however will require a foundation in attitudes and values which have to be cultivated, grown and fostered in every generation. Education to values and virtues and the cultivation of the public pursuit of personal and societal virtues are irreplaceable elements in shaping the response to the complex issues of migration flows and the refugee crisis. Thus all who educate – parents, teachers, youth leaders, politicians, journalists, poets and writers – are central to enabling all of us to respond in a way worthy of our human dignity to the phenomenon of migration. In this twenty first century migration flows have taken on heretofore unseen dimensions – 250 million migrants worldwide and 2.5 million refugees. It is giving rise to negative reactions and fears which poison the body politic in many European societies and alas has triggered xenophobic attitudes in our midst, even among Christians, here in Northern Ireland, as elsewhere, and which are in need of cleansing by the power and message of the gospel of Christ. This “contemplative gaze” is rooted in what Pope Francis refers to as “the wisdom of faith”. This wisdom – its values and the virtues it grows in mind, heart and anthropology – flow ultimately from the vision set out in the Sermon on the Mount (Mt 5.1-12). If rooted in a contemplative disposition, this gaze can lead to and effect attitudinal transformation and qualitatively new action. Interestingly, Pope Francis underlines a further, though oftentimes conveniently ignored, enabling dynamic of this “contemplative gaze” : “we also come to see the creativity, tenacity and the spirit of sacrifice of the countless individuals, families and communities around the world who open their doors and hearts to migrants and refugees” (3.3). Such individuals and communities, as referred to here, are moulding already the humus of the responsible citizenship of a future that will come. In the Word of God, in the tradition of the Church and in its Social Teaching, Christians have the recipe for this creative and spiritual work for the world of tomorrow based on the just sharing of the goods of the earth among all God’s children. If contemplation can enrich action and enhance its effectiveness, Pope Francis proposes that this disposition of a “contemplative gaze” on migration and attendant issues “should guide the discernment of those responsible for the public good and [it] should encourage them to pursue policies of welcome within the limits allowed by a correct understanding of the common good – bearing in mind, that is, the needs of all members of the human family and the welfare of each” (3.4). As many parents, grandparents and citizens consider the future of our children and youth in this age of accelerated change, of rapid advances in information technology, in artificial intelligence and the changing relationship between politics/governance, economics and the financial markets, the existential and urgent need for a contemplative approach to the métier or task of politics becomes evident. With this proposal Pope Francis is emphasising a vitally important precondition for the peaceful and sustainable survival of humanity. Pope Francis points to four foundational action points for the development and pursuit of a strategy to deal in a just and peace-building manner with these realities of our times. Four action words provide the pillars for this strategy : (i) welcome ; (ii) protect ; (iii) promote ; and (iv) integrate. These action points are self-explanatory and indeed they chime in harmony with the first priority of our diocesan Pastoral Plan which is the reference point for our Parish Councils and our Pastoral Community Forums. In other World Day of Peace Messages, as elsewhere, Pope Francis has spoken of the importance of the work of institutions, and of international institutions, in the service of the human family. This rich text merits lengthier comment and analysis. 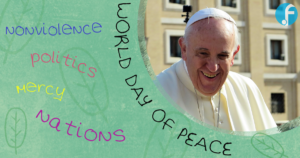 It echoes issues raised by Pope Francis in his four earlier World Day of Peace Messages. It continues to point up concerns raised by his predecessors in this now half a century tradition of Catholic Social teaching. Written in an accessible style, its five short pages are well worth reading, as we step into the New Year. As we look forward to the World Meeting of Families in August, let’s be mindful in our prayers and in our charity of the countless families whose lives and existence has been disrupted, even devastated, by conditions of poverty, war, violence, oppression and persecution. And may the living Christ, whose birth and incarnation we celebrated eight days ago, continue to inspire us to help actively and strategically the refugee, the homeless, the victims of human trafficking in whatever ways we can.